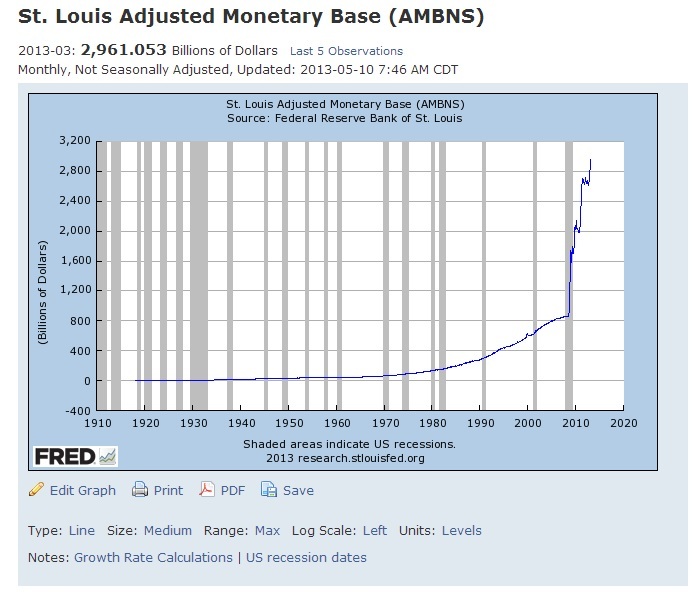 With the dramatic increase in the money supply as illustrated here with the St. Louis Fed Chart, 99% of the people are simply baffled saying – It’s got to be inflationary! But this is like the old TV commercials when Burger King used the little old lady who would look at a competitor’s burger and say – Where’s the beef? Welcome to the new International Currency – the DOLLAR! Yes the Fed assumed it was stimulating the domestic economy by purchasing US government bonds. I have been yelling – hey it ain’t gonna work stupid! The plain reason is 40% of the debt is held outside the USA. That means you cannot guarantee that the seller of those bonds will be domestic. Thus, the dramatic rise in the money supply must be looked at INTERNATIONALLY and not purely domestic. The Fed monetized those bonds creating dollars but the dollars were exported. Sorry – we live in a new world and the economic theories and understandings are from our ancient past, notwithstanding that we moved to a floating exchange rate system in 1971 as Bretton Woods collapsed. The reason nobody has beaten our computer in 30 years is quite simple. Humans are incapable of performing multidimensional analysis beyond a few layers without an appropriate tool. If you set fire to a newspaper, it will ignite and burst into flames. That is a straight forward relationship – cause and effect. However, it is not 100% true. If the paper is wet, it will not ignite. We have just introduced another variable – water. If the paper is dry but that match is wet or the striker pad, you cannot light the match. There are still other variables such as wind. So yes, in theory if you increase the money supply it should have been inflationary – stimulated the economy. But it failed because the money supply is now global in demand, not purely domestic. I was asked: “Can the dollar and gold rise together?” Yes! However, that variable comes into play when all other avenues become closed. What happens is much like the bubble in Japan. The yen was rising and that attracted some foreign capital, causing the Nikkei to soar and that attracted even more capital. A shares market can also rise with declining currency value but that relationship is associated with DOMESTIC buying as a hedge against inflation. Therefore, gold and the dollar can rise together ONLY when it is international capital flows. That did not materialize 1980-1985 because the gold rally began because of the declining dollar. This time, we may have more capital fleeing the rest of the world so that moves into US dollars, US shares, and gold. However, that scenario precludes gold rising to wild and crazy numbers anyhow and it certainly rules out the hyperinflation nonsense. The exponential rise in gold will come only after the dollar peaks and capital then once in US dollars starts to shift from PUBLIC (bonds) to PRIVATE (assets). 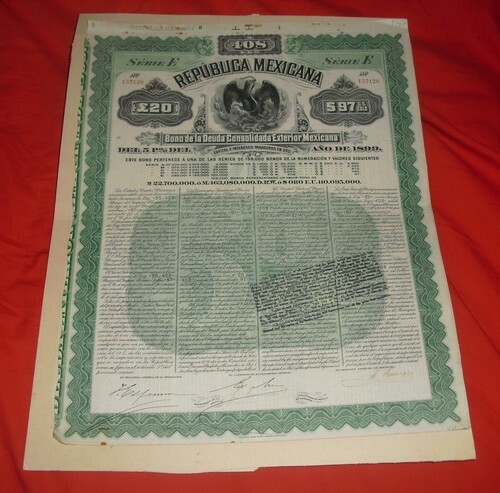 Here is an 1899 Mexican bond issued in British pounds when the pound was the Financial World Currency given Britain was the Financial Capital of the World. Consequently, the yen could not reach that level because the Japanese would not allow the issue of bonds in yen without their approval. It was a restricted currency. The Euro failed to reach that level and cannot because there is NO single federal government bond issue. The Euro is indistinguishable from all 50 states in the USA who issue their debt in dollars (single currency) but also have completely different credit ratings as all member states in Europe. Nobody in their right mind would assert that all the debt of the states should be AAA suitable for bank reserves to support the entire financial system. Why is that so hard for European politicians to understand? What they are defending with every citizen’s net worth is their failure to comprehend financial economics at the basic level. They are destroying the entire future of the next generation and placing at risk the global economy disrupting capital flows all because of their pigheadedness. China also issued bonds in various currencies to relieve the buyer of currency risk. 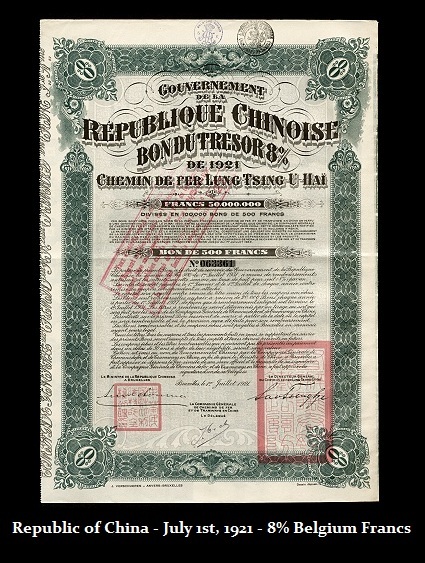 Here is a 1921 bond paying 8% in Belgium francs. Today, numerous countries issue debt denominated in US dollars. Despite all the ranting, screaming, yelling, prognosticating, and pontificating that the dollar will collapse – sorry! Where’s the Beef? The dollar is the only game in town and BECAUSE of this international standard, the Fed cannot control the money supply. People highlight “reserve banking” as dangerous – but that has been the way banking function since the 1600s. So what is new? Now add to this the ability of anyone anywhere to create a contract in dollars and for foreign governments to borrow in dollars and you further expand the global economic reliance upon the US dollar. And you really expect to reduce this giant global economy to a single cause and effect? Good luck!!!! Your not in Kansas any more Dorthy! People have tried so hard to concoct manipulation theories to explain why they have been wrong and why gold is not $30,000 an ounce today. The central banks are the LARGEST holder of gold. They are by no means trying to suppress the price of gold to hide inflation. ABSURD! It wouldn’t work anyhow. This is up there with the Salem Witch Trials. When the former communist central banks have been the buyers, why in hell would they want to keep prices low to benefit them? Come on. Some of these theories just are so desperate to explain why their one-dimensional thought patterns are dead wrong right now, they sound like a skit for Saturday Night Live. Whenever gold rallies, it is always “genuine” but every decline is because of some sinister dark force from Star Wars. Welcome to the new ONE WORLD CURRENCY – the DOLLAR! Government and most analysts are still living in a world that is long past its expiration date and does not exist since it has evolved while the thinking is frozen in time. The variables and combinations are incredible. It now takes a global computer monitoring absolutely EVERYTHING to figure out the relationships and how they will play out this time. We have created historical databases to enable the computer to see every possible combination over centuries and come back with its results. This is why the largest institutions always lined up at our door and why we had the equivalent of more than 50% of the US National Debt in 1998 under contract – $3.5 trillion. Unlike Bloomberg News, client portfolios were ALWAYS private. This is about understanding a whole new global economy – not about personal opinion.